If you're in search of a successful road diet case study to assist with a potential project in your community, look no further than Orlando's Edgewater Drive. An excerpt from Chapter 2 of Building Healthy Corridors: Transforming Urban and Suburban Arterials into Thriving Places, a collaboration between the Urban Land Institute, Rose Center for Public Leadership and National League of Cities Streets have played a major role in the development of College Park, a neighborhood adjacent to downtown Orlando, Florida. The neighborhood’s Princeton, Harvard, and Yale streets influenced the naming of the city’s first subdivision and eventually the naming of the neighborhood. Beginning in 1999, local stakeholders gave College Park a new identity by transforming Edgewater Drive, its main street. The four-lane road was extremely unsafe; it carried more than 20,000 speeding motorists per day, and it experienced crashes nearly every three days and injuries every nine days. Because the road also contained limited space for sidewalks, bike lanes, and streetscape, the city of Orlando implemented a lane reduction—or “road diet”—to regain space for pedestrians and bicyclists. Since the project’s implementation, Edgewater Drive has become a noticeably healthier and safer street. Traffic speeds and the number of crashes have been reduced, and both the volume and satisfaction of pedestrians and bicyclists have increased. The project emerged from a neighborhood improvement plan called the Neighborhood Horizon Plan and from anticipation surrounding the resurfacing of Edgewater Drive in 2001. Hoping to maximize the opportunity, the city—in collaboration with neighborhood stakeholders—formulated a vision, set of goals, and plan for the redevelopment of a 1.5-mile stretch of Edgewater between Par Street and Lakeview Street. 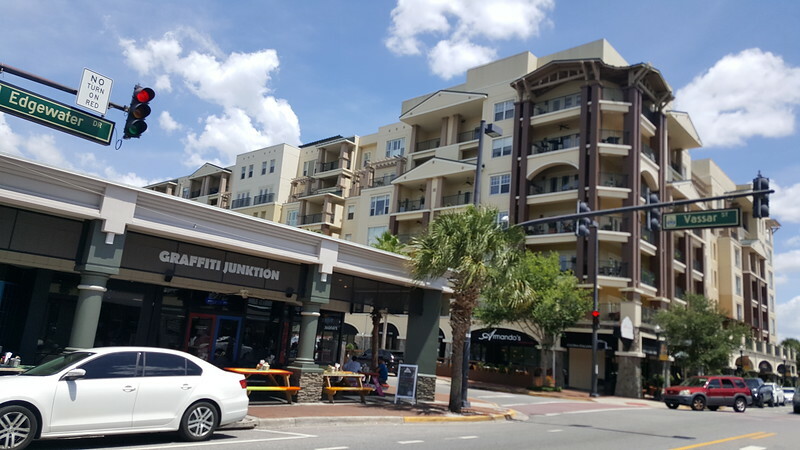 The goals emphasized the vision of the corridor as a vibrant, pedestrian-oriented commercial district with reduced incidents of speeding, improved bike and pedestrian infrastructure, and an enhanced streetscape. To achieve the goals, the city and the Florida Department of Transportation (FDOT) negotiated plans for a road diet in conjunction with regularly scheduled maintenance. This approach required removing one vehicle lane and reconfiguring the road through lane restriping; these changes were funded by FDOT and required the state of Florida to transfer control of the street to the city. After gaining control of Edgewater Drive, the city of Orlando initiated the project. Before committing to permanent improvements, the city implemented a temporary lane reduction, using tape to restripe the road, and then performed a before-and-after analysis that looked at crash and injury rates, vehicle speeds, traffic volumes, onstreet parking, travel times, and bicyclist volumes. The analysis showed that those indicators were improved by the lane reduction, and the tape was replaced with permanent striping in December 2002. Ultimately, the city converted four lanes to three; the road now has one travel lane in each direction and a center, two-way turn lane. The city also added bike lanes in both directions and widened on-street parking. Because of this project, College Park’s main street has become a thriving corridor. Safety greatly improved after the project: total collisions dropped by 40 percent, injury rates declined 71 percent, and traffic counts briefly dropped 12 percent before returning to original levels. Pedestrian counts increased by 23 percent, bicycling activity by 30 percent, and on-street parking—which buffers the sidewalks from automobile traffic—by 41 percent. In addition, the corridor has gained 77 new businesses and an additional 560 jobs since 2008. The value of property adjacent to Edgewater and within a half mile of the corridor rose 80 percent and 70 percent, respectively. Such positive results have gained national attention and satisfied local stakeholders, who made no requests to restore Edgewater to a four-lane road when it was resurfaced in 2012. With this in mind, here’s a photo gallery illustrating the present day conditions of Edgewater Drive in Orlando, Florida’s College Park neighborhood.